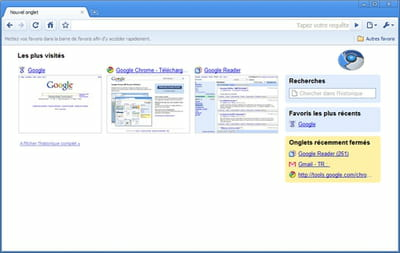 Chromium is a simple browser which allows users to surf the Internet more safely and quickly. It distinguishes itself from other tools thanks to its stability and all its practical features. High speed surfing: many browsers such as Google Chrome, Sleipnir 3, Comodo Dragon, Yandex or Flock are the basis of Chromium. It works with a high speed since it integrates Webkit. Compatibility: this program stands out from other tools since it supports all Google Chrome extensions. The user is allowed to install any kind of plug-in to extend his browser features. Confidentiality: what makes the program different from its counterpart Google Chrome is that it doesn't send the user's personal information to Google. This process offers to the user an accrued security to his information. Surfing: Chromium starts up straightforwardly. Since it supports tab surfing, the user is able to launch searches for information and watches videos or play games at the same time. It is worth to note that the interface is fully customizable thanks to many skins that are suggested. This software is under BSD license allowing partial or complete use of sources codes. It is entirely free of charge. Latest update on February 11, 2015 at 06:12 AM.